The journal Polyphonia (Polyphony) has been created with the ambition to become a forum of scientific speech regarding various aspects of musical art. 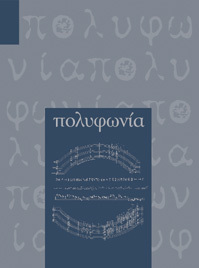 The edition of Polyphonia is not though an innovative attempt in the publishing area of musicology in Greece, because the interest in reliable information and seminal dialogue has been already arisen in the Greek musicological society with publications of respective journals in the past. Thus, the basis for the nurture, development and establishment of musicology in the publishing area had been, already and despite the difficulties, placed. In Greece, wherein the needs in musical science are keeping increasing, the journal Polyphonia intends to be a reverberation of the dynamic, which is foreseen in this science during last years. This dynamic is accomplished through the constant establishment of new musical and musicological departments in the Universities and the Technological Educational Institutions of the country. The alumni of these Departments keep staffing various cultural and educational organizations, contributing thus in the reformation of Greek musical education and in the general cultural progress and development. The cell of the first Editorial and Consulting Board of Polyphonia consists of graduates by the Department of Musical Studies of the University of Athens, confirming in this way the substantial affiliations that are being developed under the University’s Departments. The coincidence for us to be involved in the first fruits of the native educational activity of musicology fills us with the responsibility towards those, that have been so far give a great part of their work in the development of this scientific section in Greece. The choice of the term “polyphony” as the name of this journal contrasts with the specialization that is so peculiar nowadays. This name indeed proposes pluralism and collaboration between all sections and fields of musicology. And is there, where specialization puts limits and inside them examines closely and under particular methods scientific subjects, that Polyphonia consists the area of fruitful coexistence and dialectical approach of the various fields of this science, having always as a main target the substance of every qualified expression of musical art. In this framework, Polyphonia presents a broad area of subjects, including articles regarding all three main fields of musicology: Historic Musicology, Systematic Musicology and Ethnomusicology, as well as musical practice. Polyphonia welcomes also articles concerning the relationship between music and other arts, like literature, plastic arts, theatre, cinema, dance, and shows great interest in translations of important musicological texts in other languages than Greek. We would also emphasize that this journal opens communication channels towards researchers in abroad for constant information in musicological progress worldwide. Furthermore, Polyphonia considers as its obvious responsibility the encouragement and the publicity of the research in Greek art music and Greek composers, and its interest in newsreel musical subjects, giving place for the points of view of important musical personalities, through interviews and notes of them. Polyphonia is meant not only for musicians and musicologists, but also for a general public interested in culture. By this way, it intends to stimulate the interest, to offer speculations and generally to broad the cognitive horizon through the maintenance of the scientific dialogue for music. The main contributor of this journal, the editions “Koultoura” (“Culture”), embraced this effort from the beginning and proposed to realize it, consisting thus an ideal Publisher with vision and sensitivity. The less that Polyphonia can do in return is to thank them truly.